WE are currently not active in this group we apoligize. 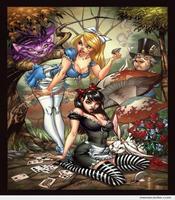 were are discussing closing it all to gether or cleaning it up and having it public Come on down the rabbit hole and see The Naughty Side of Wonderland.Enjoy the wild and crazy tea party hosted by none other then your favorite Hatterz. ***DISCLOSURE*** This is a private herd that has visions of naughty things and don’t want to get in trouble. If you feel that you may see something you would report, please leave.